Congratulations to Jenny, David, Charles & Yvonne - this year's Club Teams Champions. Congratulations to Stephen & Michael who finished 7th nationally and to Moira and Carol who finished 30th. Congratulations to Maureen & Moira who have finished 7th of 667 pairs in the National rankings. Congratulations to Jenny and David who have won the Club Championship with a score over the 2 weeks of 65.33%. The Porter Trophy, which this year goes to the highest scoring pair with an initial handicap of below 50%, goes to Yvonne Bradbury-White & Richard Campion. 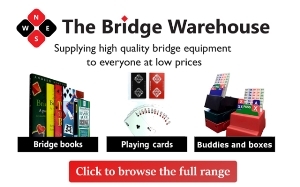 Do you or a friend want to learn Bridge? Or do you want to teach Bridge? Have a look at the Bridge for All website and view the video. Do you need a partner? If so, why not use the partner finding service under the 'Membership' menu above. Or, if you prefer, you can contact Yvonne Bradbury-White who will help you with this service. If you are a member of the club and don't yet have access to the members' area, click on the 'Membership' menu item and then enter your name, email address or EBU Number and click 'Set Password' - follow the instructions to get a link sent to your email address to enable you to create a password. Huntingdon Bridge Club does not offer bridge classes. But, if you are interested in learning, then Yvonne Palfrey can help. Look under 'Information' then 'Lessons'. Handicaps are now determined from the latest NGS grades. Welcome to Huntingdon Bridge Club. We are affiliated to the EBU and to the Cambs and Hunts Contract Bridge Association. We meet on Monday evenings at The Brampton Memorial Hall. Players should be seated by 7:20 and play will start at 7:30 pm. Visitors are welcome at most sessions. Occasionally events are limited to Club members - please check the Calendar. Further details may be found by clicking the information heading in the left hand column of this page. Winners at Huntingdon Moira Clarke & Carol Ombler. Highest placed nationally Stephen Goodwin & Michael Krause. EBU Members - Please keep your contact details, including email address, up to date. Also, if you do not need a diary or printed version of English Bridge magazine please opt out to help reduce costs and waste. Go to www.ebu.co.uk/members, log-in and use the 'my details' tab to update your details and preferences. Messages can also be left on these pages. You can also make requests for partners here.